Want to try Sprinting and Hill Climbing? 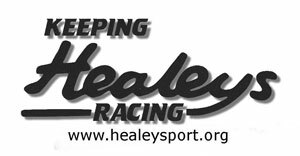 Healeysport is the motor sports centre for the Austin Healey Club UK and this website is dedicated to keeping Healeys racing. 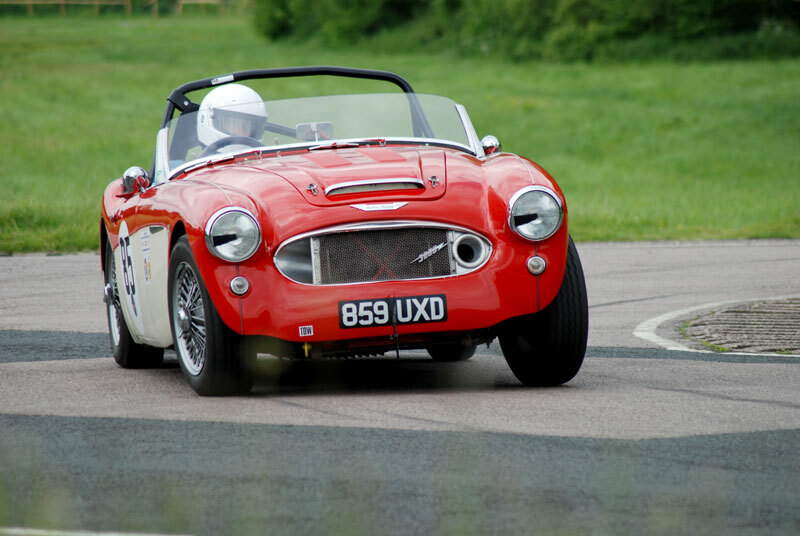 For 2019 we are offering places at our Practice Day at the Curborough Sprint track on Thursday 28 March to Healey owners who are interested in trying this very popular sport. Richard Mason is the organiser of our Practice Day and will be happy to hear from you – but be quick: so that each driver gets plenty of track time, numbers are limited. If you are keen to have a try, email him on aloyblock@gmail.com for further details. Healeysport drivers should also contact Richard and book their place as soon as possible. The cost for the day is £40 per car and driver, £20 for a second driver sharing the same car, and £15 for a spectator. This specially negotiated fee includes breakfast, a cooked lunch, and coffee or tea. For a spectator not requiring food or drink – there will be no charge. Any ‘newbie’ signing up for the Championship on the day will receive a free Healeysport shirt! The 2019 challenge will be a 14 round championship series with two Healey classes sponsored by Bill Rawles Classic Cars (BRCC) and two Sprite classes sponsored by Peter May Engineering Ltd. 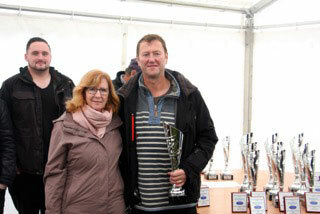 In addition to the class awards, Cape International sponsor the award for the overall Sprint and Hill Climb champion. Our 2018 Overall Champion was Colin Gale - pictured right in his Austin Healey Sprite at Harewood. Click on the Speed Championship menu above to see the 2019 events calendar and lots more. Following our practice day at Curborough, the 2019 series will take part in hill climbs at Gurston Down, Prescott, with a weekend (two rounds) of hill climbing at Shelsley Walsh, Harewood and Loton Park. In addition, there will be sprints at Goodwood, Castle Combe, Curborough and Lydden Hill plus a non-championship hill climb at St Goueno in Brittany. Each venue provides a different set of challenges to test the Healey driver's skill and abilities to the full. This series is open to any Healey driver with some or no motor sport experience and a car that can be either road standard or modified; over half the races will have target times set for each driver, to take into account the different abilities of the driver and their cars, so everyone has an opportunity to win a race. Although highly competitive, there is also a strong sense of camaraderie amongst the thirty or so drivers who regularly compete and the social aspect of this sport is very important to everyone. Healeysport now offers Jensen Healey drivers the chance to take part in the Healeysport Speed Championship and compete against Big Healeys and Sprites yet in a class dedicated to Jensen Healey cars. The regulations have been agreed with Motorsports UK to allow for any Jensen Healey - Roadster or GT - that is a standard road car or modified car to take part. With its modern, Lotus designed, 2 litre, 16 valve, twin cam engine contained in a lightweight body these reasonably priced, pre 1976 cars will be competitive in road legal form, so with some modification they will be very competitive indeed. This will also mean that we will have Healey cars from three decades in the championship, with the Silverstone's, 100's, 100/6's and Frogeye's from the 50's - the Sprites and 3000's from the 60's and now the Jensen Healey's from the 70's. Many would argue the golden era of British Sports Car production. We have drivers signed up for the Jensen Healey class but are looking for more drivers to take part. So if you have a Jensen Healey and would like to find out more email Paul Baker on paulbaker51@yahoo.co.uk Alternatively, check out the regulations for the championship and the technical regulations for the cars (menu option above) and get in touch. Do you own a Healey - Sprite, 100, 3000, Silverstone or Jensen Healey? Are you interested in getting more out of your car and doing something you have always considered but put to one side? Well, why not take part in a fantastic sport with some really friendly and enthusiastic fellow Healey owners. Take a look at our Beginners Guide to Sprinting and Hill Climbing and then send Paul Baker, our championship organiser, an email on paulbaker51@yahoo.co.uk Alternatively, you can click on our Join Us option and follow the prompts. Our annual Awards Dinner took place at the De Vere Village hotel in Swindon on Saturday 17th November. 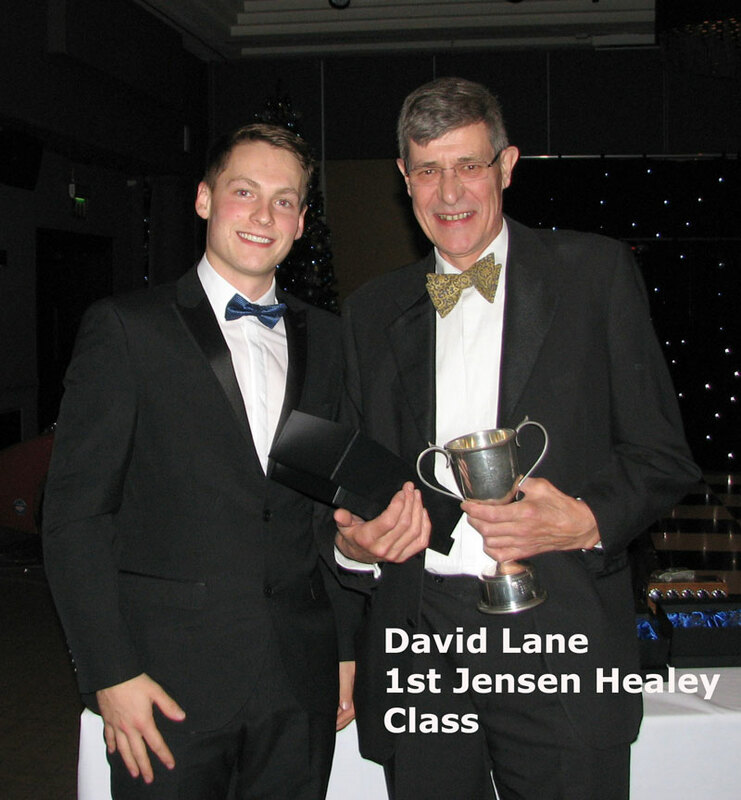 A celebration of this year's achievements of Healeys on track, deeds done and even problems encountered combined with a dinner, a superb magician called Patrick, a raffle and some fun on the dance floor. In addition to the class winning Healeys (Colin Gale's Sprite, David Lane's Jensen Healey and Richard Mason's 3000), we also had two of the Castle Combe Autumn Classic race cars - Drew Cameron's famous Speedwell Sprite and Mike Thorne's Healey 100M in the ballroom with us. 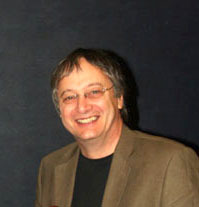 Joe Cox was our Master of Ceremonies and he had a lot to get through. The awards part of the evening was kicked off by Paul Baker who, with the help of David Price from Peter May Engineering (who sponsor the Sprite class) presented the awards to the winning Sprite drivers and then asked Jack Rawles (from Bill Rawles Classic Cars) to presented the awards to the Jensen Healey and Big Healey winning drivers. 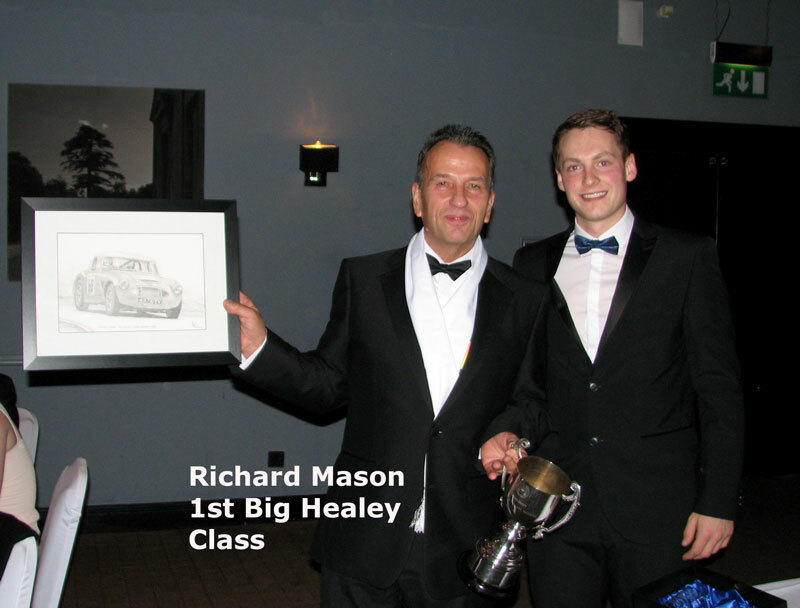 Along with the perpetual trophies, the class winners this year received a superb framed pencil drawing of their car in action, for them to admire in the years to come (all produced by David Price's father - Martin). Paul then asked John Wiseman to present some of the points based awards, in particular, the fabulous Stuart Wiseman Memorial trophy given in honour of his father for the top scoring Healey 100, which was won by John Ducker. 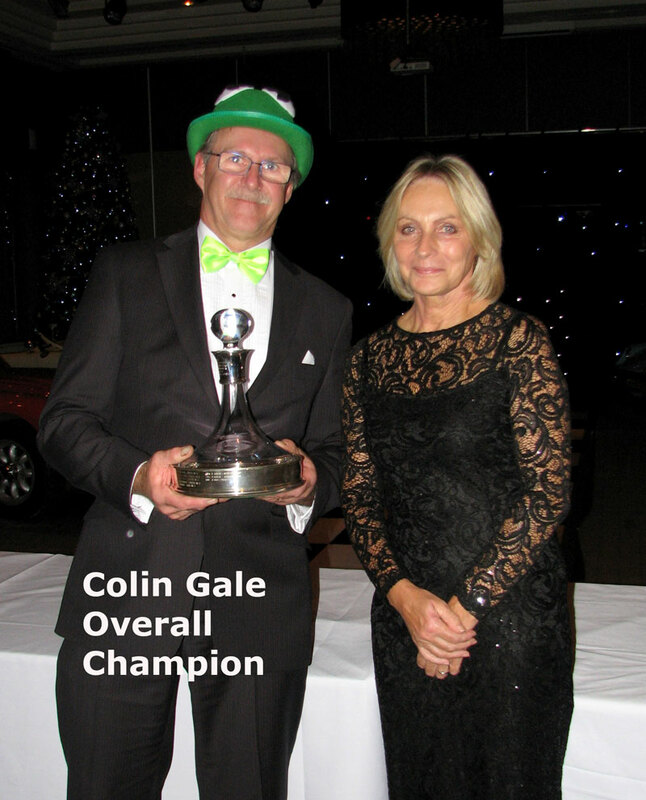 Karen Norton (from Cape International) presented all the discretionary awards, culminating in Colin Gale being presented with the excellent Cape International supplied ships decanter for being our Overall Champion for 2018. We had a retirement gift (a pencil drawing of him competing in his Frogeye Sprite and negotiating one of the tight bends at Curborough last year) for Rafe Haywood - who has unfortunately decided to hang up his racing boots. 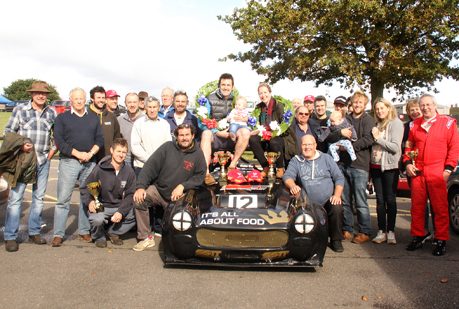 Jackie Baker, our club photographer, was presented with a huge bouquet of flowers to show the thanks and appreciation of all the drivers for her efforts in recording in pictures and videos what they get up to on track during the season. There was a rebellion amongst the ladies so the guys took up the challenge to sell the raffle tickets, with the hill climbers beating the racers by selling the most. Joe Cox then ran the raffle with his usual selection of festive and unusual prizes ably supported by Margaret Ross and Jeanette Harris. The most keenly sought, was a huge cuddly teddy bear, which was won by Drew Cameron. After the final photo's were taken, the disco got underway and the dance floor and the bar filled fast. It was a great evening, finished off by breakfast together the next morning in a private dining facility before everyone headed home for a much needed rest. Huge thanks was given to Huw Edwards and Andrew Taylor and the team at the Village Hotel for organising such a successful event. To see all the pictures taken by John Tewson click here and to see a complete list of the Award Winners click here. Phil continued to report on this series for both the AHC and the MGCC until his untimely death in 2017 by which time he had become and absolute 'fixture' in the racing scene. He is still sadly missed but very much remembered for his acerbic reporting and quirky photography and this race will gave all the cars and drivers that owe their 'press exposure' to Phil a chance to pay their respects. The race was sponsored by Lackford Engineering and was open to all Sprites, 100 & 3000 cars that competed in the Championship races until 2011 plus all Sprites running in the Midget and Sprite series to date and was run to the Regulations of the AHC Championship as last run and the current MGCC Regulations. However, after a sustained period of dry weather, the day of the race dawned exceedingly wet. It rained virtually all day but was particularly heavy during our morning practice session. The afternoon race was a mixture of rain and drizzle. Fortunately Joe Cox had managed to organise a marquee for everyone to use to get out of the rain, and also supplied complementary teas and coffees plus some superb cakes supplied by Mike Thorne's "The Original Cake Company". Despite the weather, the competition was fierce. In qualifying with the rain pouring down, it was Bruce Montgomery (pictured above right) who showed magnificent car control to take pole position with his 3000, but a whisker behind was Drew Cameron in the lightweight Speedwell Sprite on Dunlop's in second and Paul Campfield in third. After lunch the weather eased a little and a dry line appeared on the track allowing the power of the 3000's to shine in the race. The Healey 3000's of Bruce Montgomery, Oliver Chatham (pictured above right), led the field but they could not shake off the nimble yet powerful 100M of Mike Thorne (pictured right) to provide the damp but overjoyed crowds with some very close racing. Overtaking off the dry line clearly proved a challenge with several spins, but there were battles taking place throughout the field of 3000's 100's and Sprites. 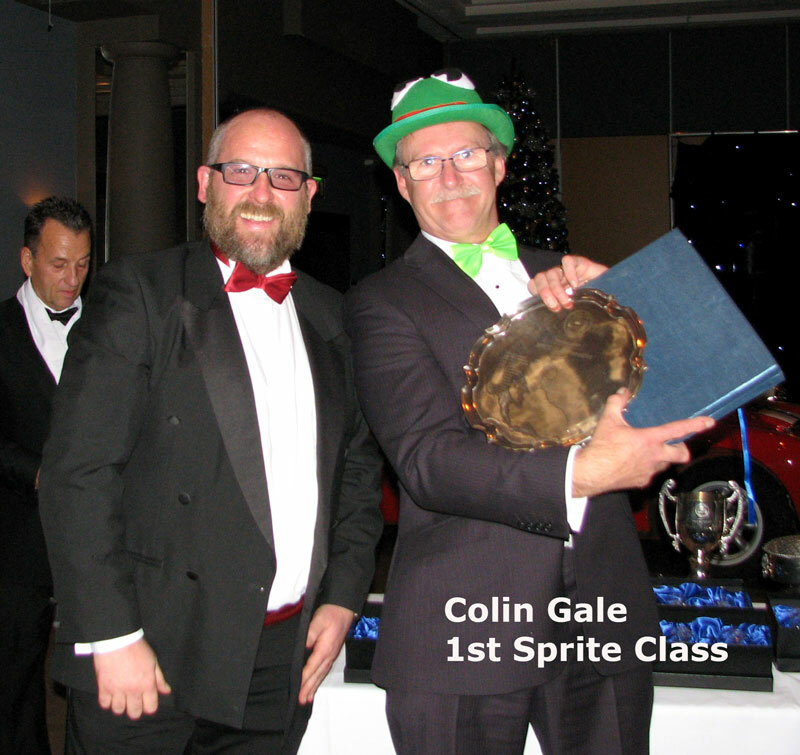 After 25 minutes, it was Bruce Montgomery who took the overall honours, with Oliver Chatham in second place from Mike Thorne in third, David Grace in fourth and Drew Cameron in his Speedwell Sprite in fifth. All the competitors deserved and got huge admiration from those watching given the atrocious conditions. 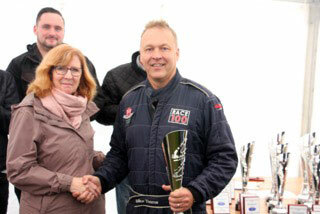 Although Mike Thorne finished third in his 100M, he was selected by the trackside commentators to receive the 'Driver of the Day' award (across all races that day) for his ability to hold third place and challenge for second in this field of cars. 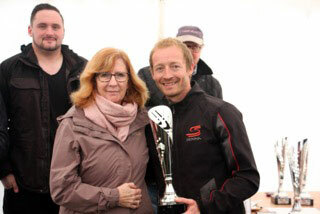 Many thanks to Joe Cox for organising this event, for the drivers who took part, for the Broster family who came in numbers to support the race and presented the prizes, and finally to Castle Combe for hosting the event. After another successful season, the MGCC Lackford Engineering Midget and Sprite Challenge overall winner was Steve Collier in his Class A MG Midget. 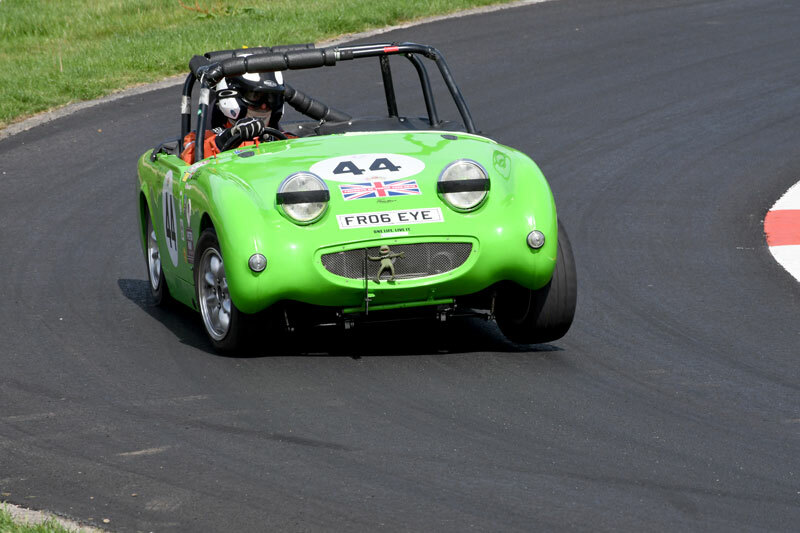 The series sponsor will continue to be Robin Lackford of Lackford Engineering who also takes part in the series in his red Austin Healey Frogeye Sprite sporting no.57. This series is open to MG Midgets and Austin Healey Sprites and there are five classes to choose from. Class A (Fully modified), B (Race modified) and C (Road Going) with the addition of the original Healey club classes of D (Healey spec - Part Modified) and E (Healey spec - Fully Modified). The rounds for the 2019 Championship can be seen on the 'Events Calendar' under the 'Spridget Challenge' tab above. Good grids are expected at all rounds, so come along to any of the events and witness what promises to be an electrifying series with close racing throughout the field. To view the 'Championship Regulations' either go to the Spridget Challenge tab above, or go to www.mgmidgetchallenge.co.uk or contact Gil Duffy on 01886 880882 or gilduffy@supanet.com if you are interested in taking part. This website holds all the Midget and Sprite Challenge race reports, pictures and race results. Find them by clicking on the Spridget Challenge menu at the top of the page.